Koi swirl the waters of the Guayaquil (Ecuador) airport pond. Have you ever had moments when your hands were full of tasks, your mind full of ideas, yet your transmission stalled and refused to move forward? With about 12G of images to sort and a month’s worth of new stories, I find myself a little bit trapped in “Groundhog Day” as I embark on my third day of trips from my hotel to the airport (across the street) in search of MIA baggage. 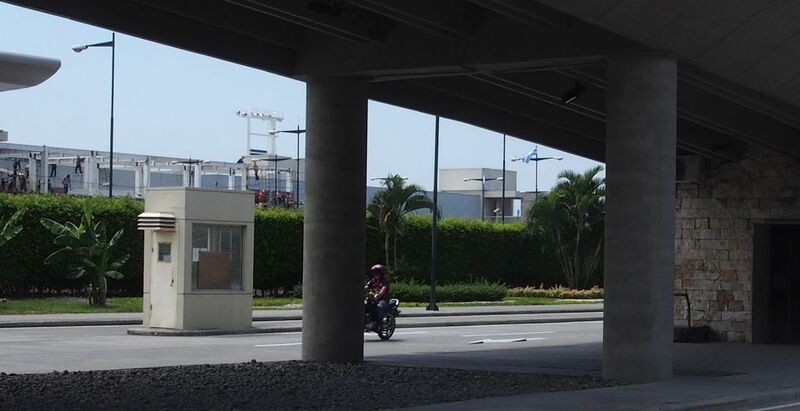 I never noticed the new addition to the Guayaquil airport until something turned my attention in that direction. Short story coming soon! The trip to the USA went well, although a detective would have had a difficult time tracking me! Thanks to my dear friends and family who shared the duty of escorting the Zeebra up and down and up that Mississippi River and back once more —all the way to New Orleans! From the waiting room of Dr. Tillman’s clinic in Vidalia, Louisiana. One never wants to be sick, but wow, isn’t this a lovely setting to soothe the soul! More soon when I can sort through the whirlpool of stories and decide where to start! Yes, it’s time to say, “Good Morning-Buenos Dias” to those golden koi! I am glad you made it back safely, but sad to see you go..not enough “Lisa time” for me, but grateful for the short visits after so many years..it was like we just picked up where we left off! Hope you find your luggage soon – and hope the small thermometer made its way back with you. 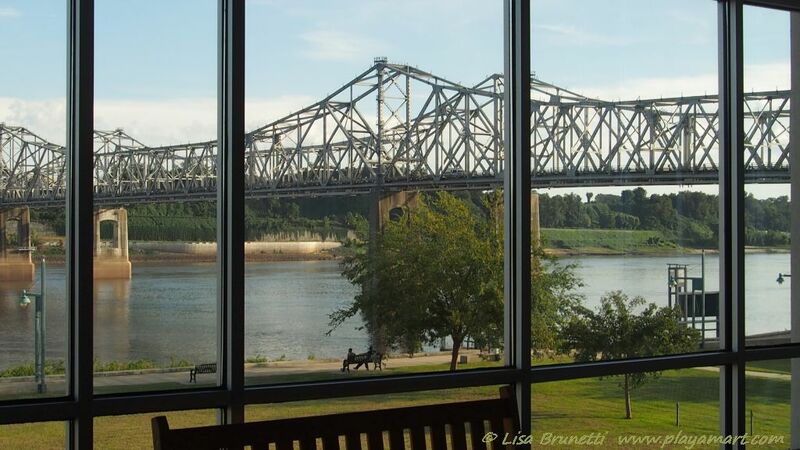 I can’t wait to see the pictures you will post in the future from your visit to Mississippi!! Love ya girlie! It was great seeing you, and thanks again for lunch, btw! The thermometer had better find its way back, along with its baggage mates! Heading to the airport now. Glad to see you back home and safe with your travels, missing luggage is major yuk! Hope all is well at home and that the “eyes” offer the protection you were looking for. Love the initial image here and looking forward to seeing more of your trip and family stories. You create “home” wherever you are!!! Glad you made it back safely. I hope your trip was eventful and picture filled. 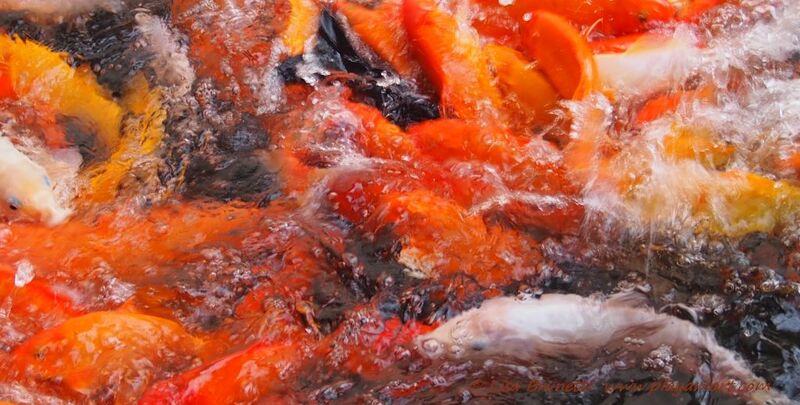 Love the abstract quality of the koi! It is so good to have you back. Mary and I ate breakfast at the Air Suites this morning! We wish we had run into you! God bless you on your quest to locate your luggage. These things generally have a way of working out. ha.. i was probably upstairs reading your posts!!! luggage has been found, and i spent the afternoon at the ESCoffee headquarters.. Timeout post will feature the impromptu painting session! wow.. it’s hard to believe you were so very close…..
We love the Air Suites – it is so close to the airport and yet peaceful and quiet. I wish we had known or, better yet just bumped into you in the hallway! We were in room 202. We are glad they located your missing luggage. Mary said it was probably filled with art supplies from the states. Have a safe trip back north. Great you are home, and your luggage too. That will be very interesting indeed. I have faith in the all-seeing eye. 🙂 Maybe the eye should have been on your luggage too. The centre of the hand on your avatar is like an eye. So glad to know you’re home safely, and that the luggage is found. The koi are gorgeous — if you have to have a whirlpool, it might as well be a beautiful one! I’m looking forward to seeing and hearing what you’ve been up to! May you get your luggage soon. Great koi photo!